a cappella behind the scenes: 無伴奏合唱節最新消息 A Lot of Festival News! The a cappella Festival is in full swing! There is a lot of new information, read and see! 即將於４月１日舉行的2011無伴奏大師系列: The Swingle Singers 已經全場爆滿! 買了飛的朋友們，恭喜你！請準備好你的雙耳去迎接絕讚的音樂! 去不到的朋友們, 不用灰心, 以下送上短片為大家解愁! April 1: The Swingle Singers concert is completely sold out! For those who have bought tickets, prepare to be amazed! For those who couldn’t get any, don’t worry, here’s a short clip of their performances. April 9: There will be a whole afternoon of a cappella music for free next Saturday at the Hong Kong Cultural Centre outdoor Piazza. We are pleased to announce a special overseas guest for this event, the POPPHONE SINGERS (斑馬線) from Taiwan! We last saw them in July 2008 and are happy that they are returning to sing for Hong Kong! Watch this clip, and come on April 9! 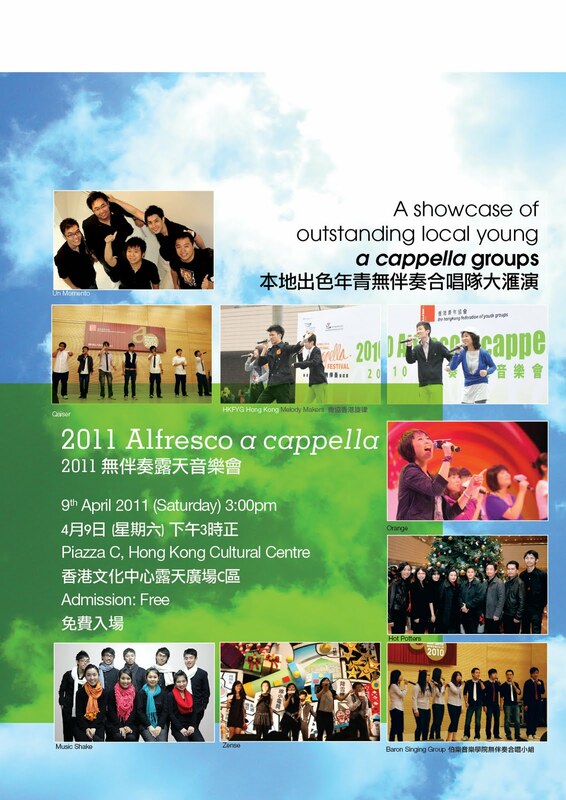 April 30: HKMM’s show ‘a cappella NEW in Town’ is sold out, more than one month in advance! Woooo! We are working hard to bring you a great night of music!